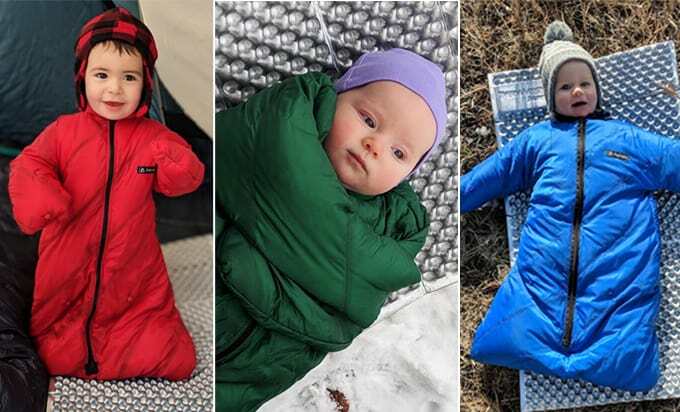 If you were an avid camper before baby, then you likely want to hop right back into it – but how in the world do you find a safe baby sleeping bag that will keep them warm too? But if you surf Amazon, you’ll likely see a whole lot of everything BESIDES sleeping bags that are ready for camping – different kinds of swaddles, bunting bags, etc.. It then gets kind of scary to think about camping, because you worry about keeping your baby warm safely, and if that’s even possible! Guess what guys – it is! New designs have came out (in the form of Morrison Outdoors’ newest baby sleeping bag) and it’s everything you’ve wanted that was finally created by a pediatrician, eagle scout, and most importantly… parents themselves! Let’s dive into the different sleeping situations to keep your baby warm and cozy on your next camp trip! My overview table below is organized by age, with sleeping bags and gear for the youngest babies on top. 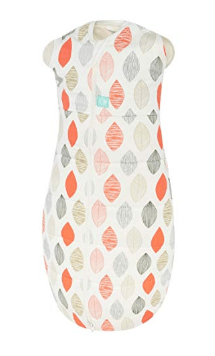 Ergopouch Baby Sleeping Bag (3.5 TOG) with Convertible Legs! What clothes should baby wear to sleep while camping? 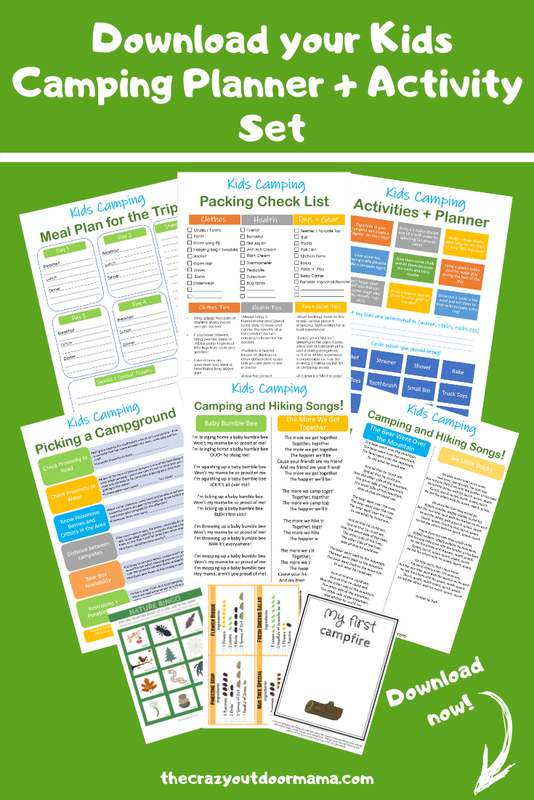 Before we go on, don’t forget to download your 9 page kids camping planner! 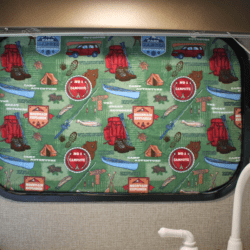 RV and travel trailer camping parents – I haven’t forgotten about ya! Additional sleep tips to make camping with your baby a success! Do you feel a LITTLE LESS nervous about how to get your baby to nap and sleep while camping? I hope so! A good sleeping bag when camping with your baby is only a piece of the puzzle, but it can help with peace of mind knowing that your baby is staying warm at night and safe! I wanted to make the table easy to navigate, so have organized it by age. There are swaddles blankets, transition swaddles, wearable blankets and more – scroll down to find what’s best for your situation! “A TOG is a unit of measurement for insulation and warmth of sleepwear and bedding. Put simply, the lower the TOG rating, the lighter the fabric. The higher the rating, the more padded and insulated it is. I have included mostly TOG 3.5, as most of us camping will be in cooler weather at night. However, if you see one you like below click on it as it’s likely offered in a different TOG if you happen to be camping somewhere warmer! Related: Find exactly what else you need to pack for a stress free camp trip with your baby! 100% Super soft Merino wool! Accepting preorders, will ship in July 2019! Warm down to as low as 20 F! Fully enclosed footbox to keep feet extra warm! AAP approved – It meets all AAP SAFE Sleep Guidelines, and even has an optional swaddle fitting for younger babies who are more comfortable this way! Perfect fit design – The collar is comfortable but snug so that your baby’s head won’t slip inside, and there is a roll up bottom to shorten the length of the bag so it fits just right! Easy to wash – Machine washable with premium 1.1oz ripstop nylon with baby-safe waterproofing that provides excellent accident-resistance while maintaining breathability. 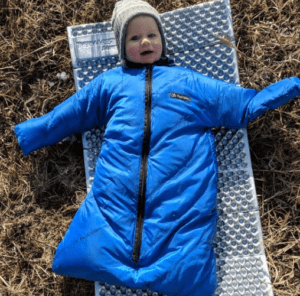 While it is nice to have some basic, dependable wearable blanket layering options that I listed at the start of this article, if you are an avid outdoor family you can be prepared for anything (early spring and late fall camping especially!) with a well made sleeping bag like this! There are a couple of options we’ll cover, each with their own pros and cons. If you’re sleeping with a young baby, it’s always important to make sure that you avoid using too many blankets and have a solid, flat sleeping surface. I have always co slept with my babies, however there are plenty of other options that may make you feel more comfortable! Short sleeve / long sleeve base layer – Depending on the temps, you can put a long or short sleeve base layer (no legs) that goes on underneath everything. While there are lots of really nice, fancy ones for babies (check out Patagonia kids! They’re great!) you’ll probably be fine with just a simple cotton one. Onsie PJs (with feet) – onsies will be your best bet for keeping them the warmest since it’s one continuous piece of clothing and will contain their body heat the best! Warm Sleep sack– A wearable blanket will always be safer than trying to layer blankets on them! 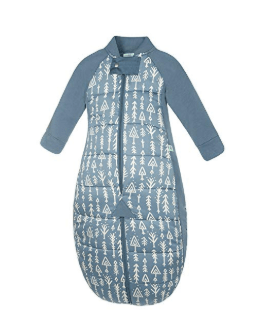 I love this wool sleep sack, and this cozy swaddle for younger babies! Hat and mittens – A simple cap and mittens will do alot to keep your baby warm while camping, especially for babies with little hair! Socks for wear under onsie PJ – This is just nice for an added layer of warmth. Check out this wool blend set of 6 tht is a good mix of wearable (not too itchy!) but still warm! 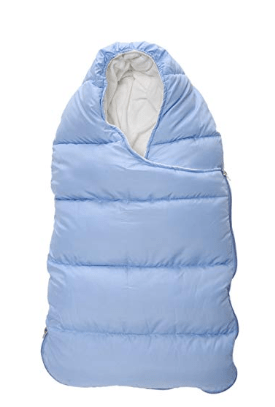 If spring or fall, a camping baby sleeping bag – In most places, summer temps don’t fall so low at night that you need this, however, if it’s getting below 50 F, I would recommend getting an actual sleeping bag for your baby. This is the ONLY sleeping bag for baby I would recommend that is durable enough as well as gentle and warm for the outdoors! 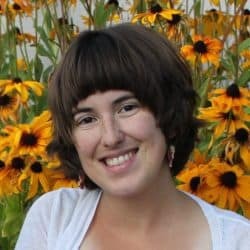 There’s ALOT of stuff to remember to do and pack if you don’t came often – after camping with my three kiddos so many times, I got it down to a science and want to help you! 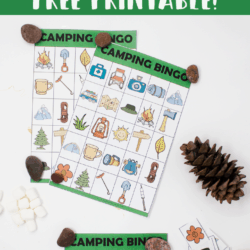 Here’s what you’ll find in this camping planner! It’s always important to always lay a good a base, and if you’re tent camping, that means using a sleeping pad of some sort! Thick blankets, wool preferable – Just fold them up nicely under the base of your sleep area! Memory Foam Pad – These are fairly cheap and are nice because you can cut them to the perfect size! See the economy choice and the super awesome, camp ready, comfy choice! Sleeping Pad – These are normally self inflating to very little inflating (like 6 breaths) pads people use under their sleeping bag. Ideal for co sleeping or baby sleeping on their own pad! This is a pretty high rated sleeping pad peple love! I absolutely love how easy this thick memory foam camping pad is to set up and take down – plus its rugged enough for rough play by the little ones! This might be the easiest choice if you don’t feel comfortable co-sleeping, but also don’t want to spend any extra money on sleep set up for your baby! It’s nice that baby is off the ground, and it offers more opportunity for insulation under the pack n play mattress! I’ve seen some people get those memory foam pads and cut them to size into two pieces – one for under the pack n play on the ground, and one under the mattress of the pack n play! Blackout Pack N Play add on – I love love love this because summer days are long, and it can be pretty hard to put your baby to sleep while camping if they are used to the darkness, and it’s still light out! Check out this black out cover here if you’re concerned! Day use opportunities – This is multifunctional because if you choose to use a pack n play, you won’t need any additional “containment” device that comes in SO handy during chore time when it’s not safe for baby to be roaming! This black out cover is SO helpful to use with pack n plays if you’re a traveling or camping family! It drastically reduces light and distractions, making sleeping way easier for your baby while you’re out! This is a great option if you have a smaller tent, have limited packing space, or plan on hiking around while you’re camping and so need to take your stuff with you! 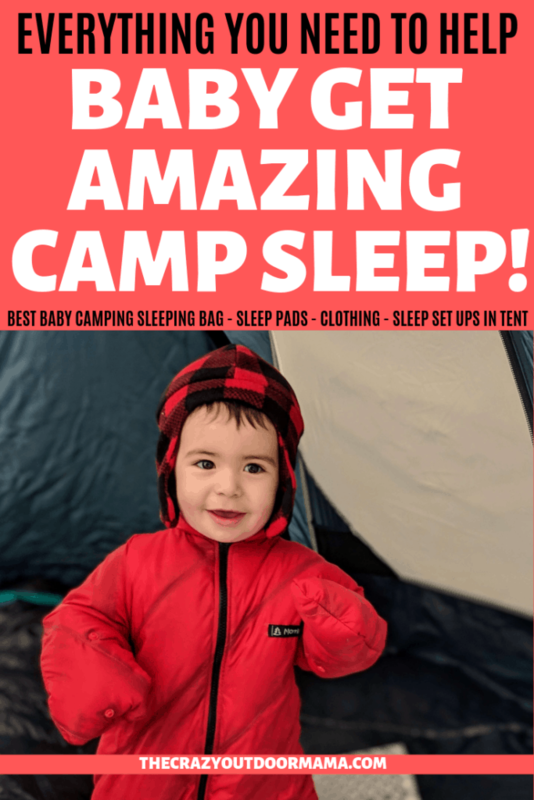 Related: A nice sleeping pad can do wonders for your next family camp trip – find out the rest of the handy camping baby gear that can also help with that! Depending on if weight is a concern for you, there are plenty of sleeping pads that will get the job done! 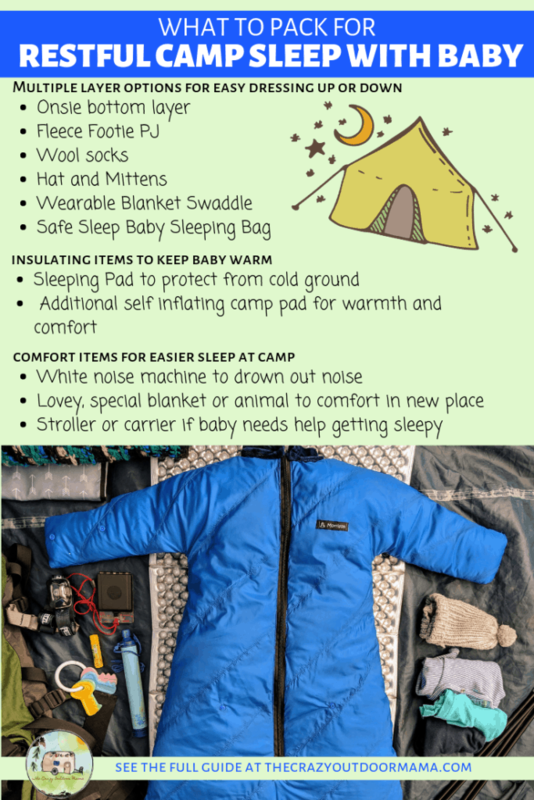 Here are some options and infofor sleeping pads while tent camping with your baby! Minimal Base that goes on the ground (either by itself or paired with a nicer self inflating sleep pad)- Therm a Rest’s classic sleeping pad is about as basic as it gets, but it does get the job done! If you’re just getting into camping and don’t want to spend a bunch, this is for you! You can sleep on JUST this pad, but it will likely be more comfortable and warmer if you get some other kind of sleeping pad! Single Self Inflating Camp Pad (1.5 inch) – This is a great sleep pad that is is not from a name brand, but it’s a diamond in the rough! It packs super small, and is great if you’re looking for a less bulky option that still performs! It is also extremely comfortable, and obviously much cheaper than the next camp pad! Double Self Inflating Camp Sleeping Pad (1.5 inch) – If you don’t think you can squeeze onto a single camp pad and intend on co sleeping, this is for you! It’s still comfortable without the bulk, and requires little assistance to get it inflated! Single Self Inflating ULTIMATE Comfort (4 inch mattress!) – Not gonna lie, this is going to be the most comfortable sleep pad for baby and you thing here! If you plan on co sleeping, this might be your jam because it is really warm, and it is so thick it makes it easier for achy joints and such we get from sleeping on hard or uncomfortable surfaces! It rolls into the size of a sleeping bag, and is quite durable! My favorite of all, especially since I nursed my 3 babies and it made camping so much easier to not have to leave the warmth of my bed to feed them! Een if you co sleep at home, you may not feel comfortable doing so while camping depending on the situation. If you need to use a sleeping bag because it’s so cold, I would not recommend co sleeping because it’s way too easy to be half asleep and end up covering your baby’s face in the night with the bag. To me, the only safe way to co sleep while camping is out of the bag, and on a safe surface such as the pads I mentioned above! Co sleeping is a great option if your baby is having a tough time sleeping by him self somewhere new, if you’re nursing, or you just want added warmth on super cold nights! Still dress your baby warm – Your baby still needs to be dressed warm, especially if they are at the age of moving around! I would probably still use a baby camping sleeping bag, especially if you have movers who don’t stay next to you (and get your warmth!) while you sleep! Dress warm above your torso – If nursing, sleep with your torso out of the sheets so that you don’t, in your half asleep stupor, pull your baby down to nurse consequently putting him under the blankets. 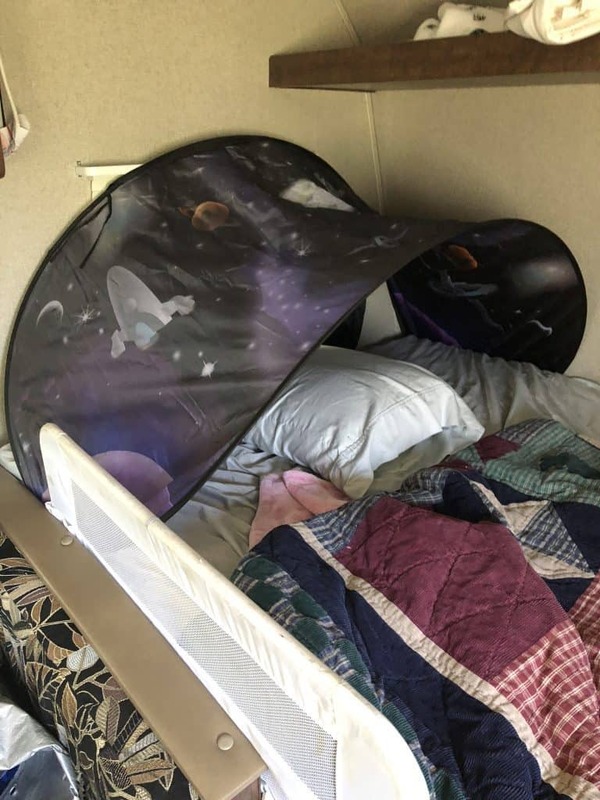 I co sleep in our camper, and as a breastfeeding mom, it was the easiest set up (we also co slept at home) but of course only do this if you feel comfortable! While camping with a baby in a much more controlled environment is easy easier than tent camping, there are still some challenges to hurdle! We camp in a relatively small pull behind (18 ft) that has a queen and two bunks with hardly any walking space! That meant there was no room for a pack n play, so we had to figure out how to modify one of the current sleep areas to fit our twin baby girls! Here are some quick tips to make RV sleep with a baby work! Add a bed rail to a bottom bunk – This will keep non standing babies contained during sleep – In fact, you might even find some bed rails that are tall enough to leave no gap at the top for even standing babies to get out! Adding the bed rail essentially converts the bottom bunk into a giant baby crib! Use a baby tent on a big bed – Baby tents like the Kidco Peapod are another great option for young babies who aren’t rolling too much yet! Just pop it up on a spare bed you have, and it’s ready! Co-sleep in the biggest bed in the RV! – I always add bed rails on any exposed sides of the bed for safety and follow the same rules as tent camping while co sleeping. Minimal blankets and a firm surface! BONUS: it can serve as a play area during the day (with supervision) for babies to play inside! 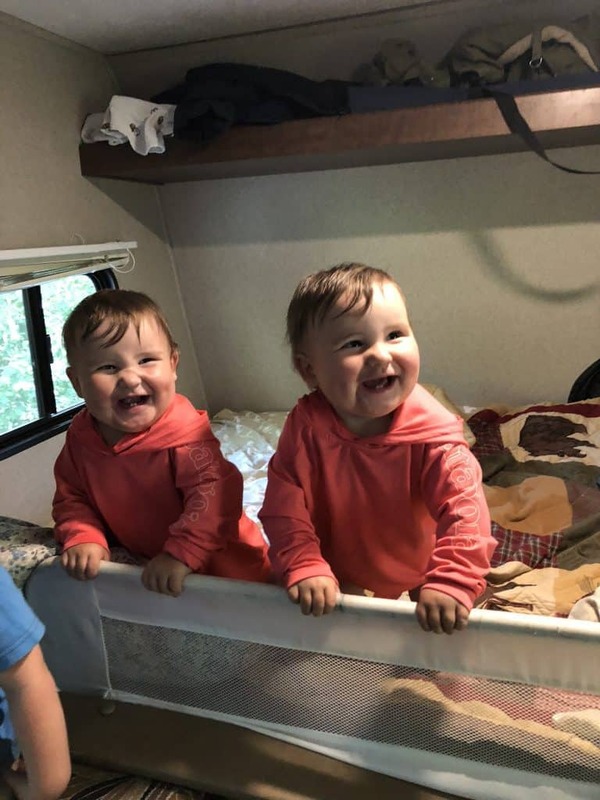 Use white noise – Hanging out in the camper after all the kids are in bed is a favorite, and we love using the white noise machine our kids now and love at home while we’re out camping so that we don’t have to worry about waking them while we’re doing chores or talking! I just tucked the edges of this sweet “dream tent“, and drape a blanket over it to create a darkened sleep spot. It does have little fabric doors, and for whatever reason didn’t face them out for this picture (it adds additional light blocking!) Obviously this is a set up you should only do if you feel comfortable with! Always have a monitor in your camper to listen for anything, and check in your camper often! 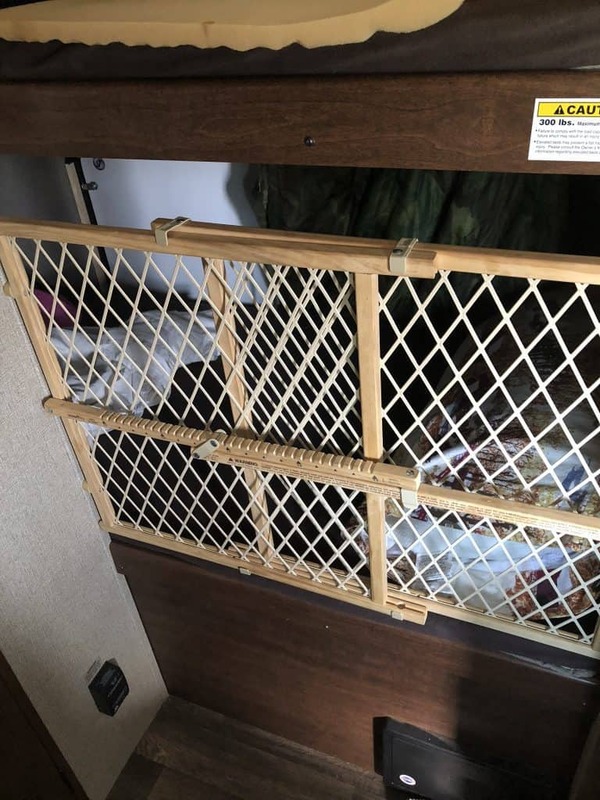 While this is my toddler’s set up, you could easily switch the baby gate out for an extra tall bed rail for added security (this is a pressure mount one, however, a bed rail will likely be long enough to reach the wall and get added stabilization!) and turn it into a big baby crib! 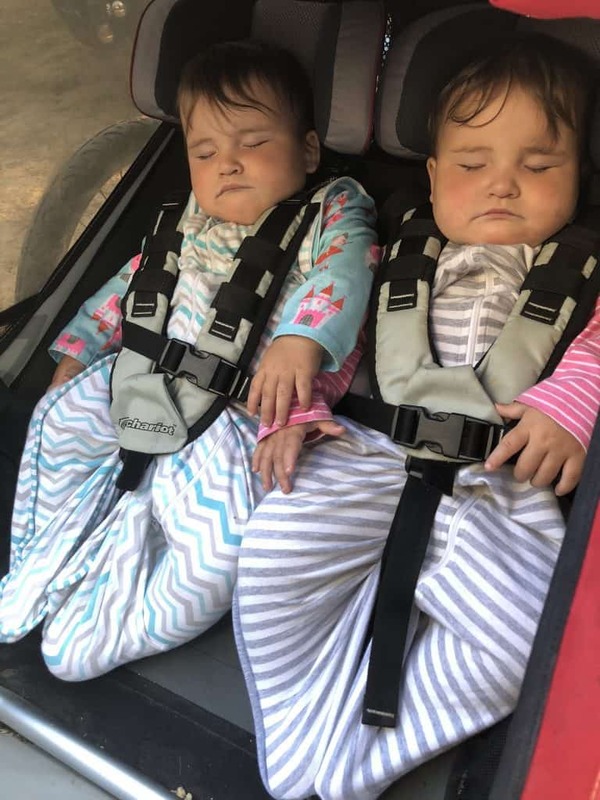 Sleep is definitely the biggest concern when it comes to camping with your baby – after all, it probably took months of sleep deprivation to get them to where they are now right?? How to set your next camp trip up for success and get your baby to sleep! Always be sure to make bedtime while camping as close to bedtime at home – Make sure to bring any special lovies, blankets, noises, books etc with you and keep a similar routine! Prepare to nurse / feed/ lay with them to sleep – At home, you can likely close the door and let them fall asleep. Camping? They can hear everything, and you sometimes need to get back in the tent or camper to get something! Just know you might have to spend extra time to get them down. Don’t worry though, it’s unlikely a couple of nights doing something different will ruin any good habits they have! BRING A CARRIER – Probably the most important, because sometimes it’s nice to not spend an hour and a half getting a baby down (especially if they are resisting and you’re not making any actual progress!) Front carriers are good, but my jam has always been backpack style carriers because they often have “shades” that I can safely drape a blanket over to help darken and quiet things for them while I am still able to go about my business at camp! This dude has been passing out in his backpack carrier since like 3 months! It has been a lifesaver when we’ve been out camping or hiking and he’s too hyped up too sleep! How cold is too cold to camp with a baby? – Once temps start getting below freezing, many sleeping pads are no longer rated as functional, so under 30 F. Obviously, if you don’t have the right gear such as wool layers and a good sleeping bag then that temp will be much higher! How do I keep my baby warm at night while camping? – A combination of proper warm layers and a well insulated sleep area can do wonders to keep baby warm! Make sure to get a good sleeping pad for your baby to sleep on so they are insulated from the cold ground! 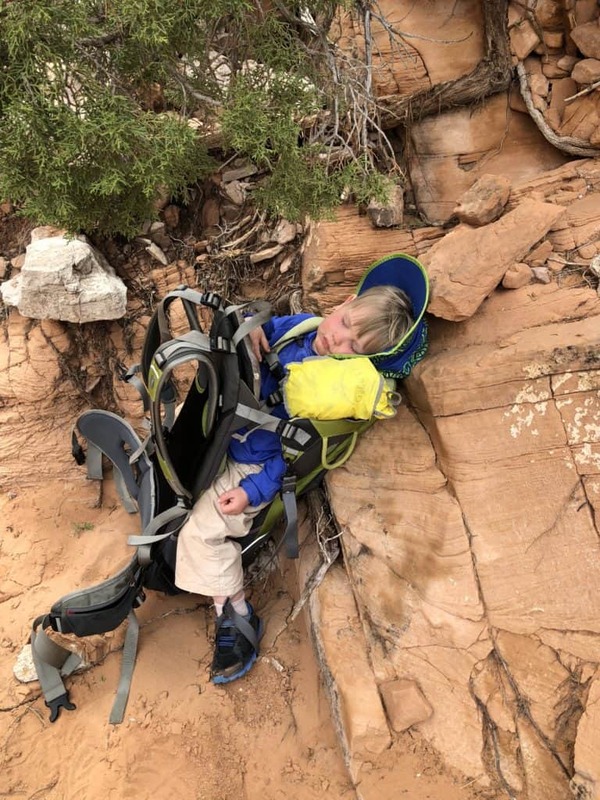 How do you get a baby to sleep while camping? – Being honest, a combination of exhaustion on the baby’s part, patience on your part, and some planning and realistic expectation ahead of time. Make sure they are cozy, comfortable, fed, and if nothing else works walk them to sleep or lay with them in teh tent or camper till they sleep! If you feel like I missed anything, please don’t hesitate to comment! I want to help everyone out as much as possible! Pin this quick reference infograph so you’r ready for that next family camp trip!